I’ve had a bit of a thrash this week and sort of enjoyed it. Hard running doesn’t scare me when I don’t know how hard to run. Hard running when I do know in advance just how much it’s going to hurt gives me the complete, nightmare, screaming heebie-jeebies.I finally ran my Magic Mile on Friday lunchtime. I met Diane who was going to pace me on her bike after I’d done a brief warm-up and caned it for a time of 6:16 over an out-and-back course. 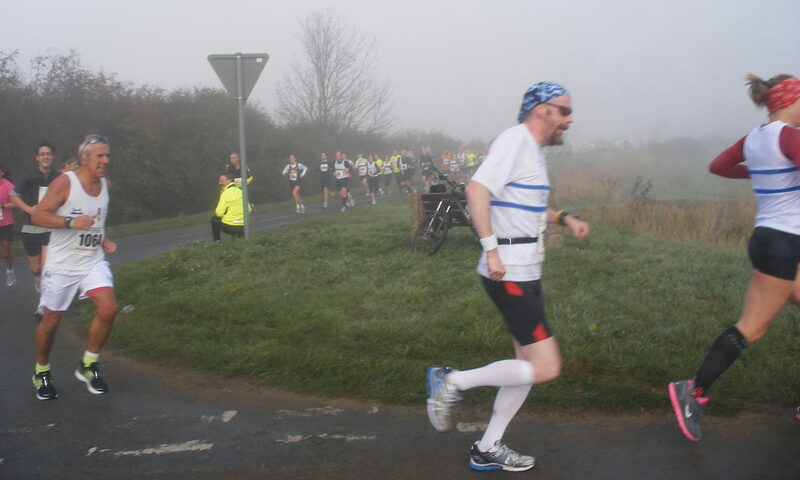 The weather was blustery and I had a headwind on the outward leg which which was also ever so slightly downhill. My splits were remarkably palindromic. I logged 1:30.8, 1:36.3, 1:36.8 and 1:31.3 for each quarter-mile. I felt okay in the first quarter but came out of shelter and into the wind in the second. The lactic built horribly in the third and the last quarter was just clinging on.Diane had placed an orange plastic bag of sand at the finishing line and I could see it from about 200m out. There is an odd effect in racing. Time shrinks but distance increases. This is especially true when you’re going for a time. The time you have available runs out much more quickly than you are able to cover the ground between you and the finishing line. That little orange bag of sand sat there in the distance while I could hear the second hand screaming round the watch faster and faster. I took a little time to recover. I couldn’t just collapse and heave my lungs out onto the pavement. I wanted to. Really wanted to. Firstly, I had to look manly because I had not only Diane as an audience, but there was another young man I’d passed a couple of hundred yards back down the path. He was coming up and it’s never seemly to have someone you have just steamed past step over you a couple of minutes later. You just look like a sad, old man in the throes of a heart attack. I didn’t fall over but I did wobble a bit. I didn’t do parkrun yesterday. They needed volunteers so I acted as timer instead. It was good to see so many PBs. I don’t think I pushed the button too soon on any of them. I took part instead in the Chariots of Fire relay round the centre of Cambridge and through some of the colleges. Teams of six run the course of 1.7 miles and conditions were good. There was a little rain in the air part-way through the race but it didn’t affect things for me. We were worried that it might be a little slippery over the cobbles in the colleges but in the end, only Ruth found things a little tricky. The rest of us were lucky. I picked up six places in the first half-mile but lost three between there and the end. I can console myself with the thought that each place was lost to someone much younger than me even if one of them was to a girl: I got chicked. No matter, I had a good battle with one of them for the best part of a mile and we weren’t hanging around. At one point, we passed a slower runner, one on each side, going into a tight turn into one of the colleges. She must have had a bit of a fright, poor thing. He finally kicked harder than me with about 400m to go. I couldn’t quite summon up enough to stay with him with all the lactic my legs had built up but at least I wasn’t overtaken by anyone else from that point to the end. I crossed the line then stopped my watch on 10:59. I was pleased with the time. The whole race was a bit of a blur. Unlike the Cambridge Half, there just wasn’t time to soak up the atmosphere. It wasn’t until we were heading for the pub after the race that I noticed that we’d run along the side of King’s Chapel. There was still a string of runners on the course. I was pleased for us all as a team. We had all run well. I don’t yet know what our combined time was. We won’t get individual lap times which is a bit of a shame. There is no chip timing. It’s probably just as well. I don’t want to take it too seriously. Honest. I found Chariots easier than the Mile. That’s not only because I wasn’t running quite so hard. It was a new experience for me; I genuinely didn’t know what to expect. I know that running a Mile is a really stupid thing to do. I’ve done enough of them now to know it hurts. Happily, it doesn’t hurt for long if you can run hard enough. I didn’t really know how hard to run this morning. I was racing other people and picking them off or running only hard enough to stave them off. My time wasn’t important for once. That was fun. People were asking about my shoes. Once again, I didn’t really notice them. I’m getting used to them now and apart from a little twanging from my calves which disappeared after I’d stretched and rolled them, there were no ill effects. I’ve seen photographs of me in action this morning and I’m almost looking athletic. My head is still too far forward but I’m nicely upright and balanced in most of the pics. I just need to find a way of pulling my head up a bit more. I’m much more vertical than I used to be. I still lean forward when I’m accelerating up to speed but I can cruise quite quickly and keep that upright position. I’m definitely making progress.